PIC Microcontrollers are a powerful platform provided by microchip for embedded projects; its versatile nature has enabled it to find ways into many applications and is yet to grow a lot. If you have been following our PIC tutorials then you would have noticed we have already covered a wide range of tutorials on PIC microcontroller starting from the very basics. In the same flow we are proceeding to learn the communication protocols available with PIC and how to use them. We have already covered I2C with PIC Microcontroller. In the vast system of embedded applications, no microcontroller can perform all the activities by itself. At some stage of time it has to communicate to other devices to share information, there are many different types of communication protocols to share these information’s, but the most used ones are USART, IIC, SPI and CAN. Each communication protocol has its own advantage and disadvantage. Let’s focus on the SPI Protocol for now since that is what we are going to learn in this tutorial. What is SPI Communication Protocol? The term SPI stands for “Serial Peripheral Interface”. It is a common communication protocol that is used to send data between two microcontrollers or to read/write data from a sensor to a microcontroller. It is also used to communicate with SD cards, shift registers, Display controllers and much more. 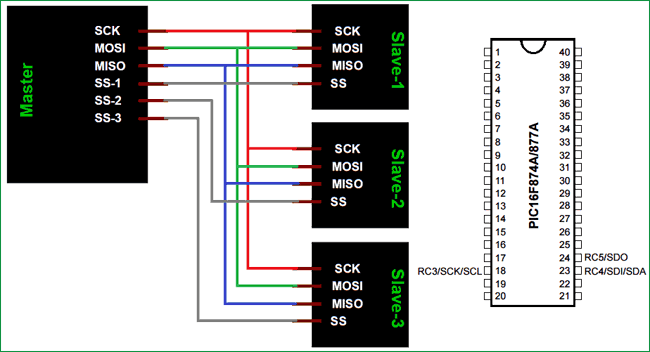 The five wires required for the communication are SCK (Serial Clock), MOSI (Master Out Slave In), MISO (Master In Slave Out) and SS (Slave Select). The SPI communication always takes places only between a master and slave. A master can have multiple slaves connected to it. The master is responsible for generating the clock pulse and the same is shared with all slaves. Also all communications can be initiated only by the master. The SCK pin (a.k.a SCL-serial clock) shares the clock signal generates by the master with the slaves. The MOSI pin (a.k.a SDA –Serial Data Out) is used to send the data from the master to the salve. The MISO pin (a.k.a SDI – Serial Data In) is used to get the data from the salve to the master. You can also follow the arrow mark in the above figure to understand the movement of data/signal. Finally the SS pin (a.k.a CS –Chip select) is used when there are more than one slave modules connected to the master. This in can be used to select the required slave. A sample circuit where more than one slave is connected with the master for SPI communication is shown in the circuit below. We have already learnt I2C communication with PIC and so we must be familiar with how I2C works and where we can use them like I2C can be used to interface RTC module. But now, why do we need SPI protocol when we already have I2C. The reason is both I2C and SPI communications are advantages in its own ways and hence is application specific. To an extent the I2C communication can be considered to have some advantages over SPI communication because I2C uses less number of pin and it gets very handy when there are a large number of slaves connected to the bus. But the drawback of I2C is that it has the same bus for sending and receiving data and hence it is comparatively slow. So it’s purely based on application to decide between SPI and I2C protocol for your project. Enough of basics, now let us learn how we can use SPI communication on the PIC16F877A microcontroller using the MPLABX IDE and XC8 compiler. Before we start make it clear that this tutorial only talks about SPI in PIC16F877a using XC8 compiler, the process will be the same for other microcontrollers but slight changes might be required. Also remember that for advanced microcontrollers like the PIC18F series the compiler itself might have some library in-built to use the SPI features, but for PIC16F877A nothing like that exists so let’s build one on our own. The library explained here will be given as a header file for download at the bottom which can be used for PIC16F877A to communicate with other SPI devices. In this tutorial we will write a small program that uses SPI communication to write and read data from the SPI bus. We will then verify the same using Proteus simulation. All the code related to SPI registers will be made inside the header file called PIC16f877a_SPI.h. This way we can use this header file in all our upcoming projects in which SPI communication is required. And inside the main program we will just use the functions from the header file. The complete code along with the header file can be downloaded from here. Inside the header file we have to initialize the SPI communication for PIC16F877a. As always the best place to start is the PIC16F877A datasheet. The registers which control the SPI communication for PIC16F8777a is the SSPSTAT and the SSPCON Register. You can read more about them on page 74 and 75 of the datasheet. There are many parameters options that has to be chosen while initializing the SPI communication. The most commonly used option is the clock frequency will be set to Fosc/4 and will be done in the middle and the clock will be set as low at ideal state. So we are also using the same configuration for our header file, you can easily change them by changing the respective bits. This function is used to set the microcontroller to work in slave mode for SPI communication. During slave mode the pin RC5 should be set as output and the pin RC3 should be set as input. The SSPSTAT and the SSPCON is set in the same way for both the slave and the master. The SPI Write function is used to write data into the SPI bus. It gets the information from the user through the variable incoming and then uses it to pass to the Buffer register. The SSPBUF will be cleared in the consecutive Clock pulse and the data will sent into the bus bit by bit. The SPI ready to Read function is used to check if the data in the SPI bus is received completely and if it can be read. The SSPSTAT register has a bit called BF which will set once the data has been received completely, so we check if this bit is set if it is not set then we have to wait till it gets set to read anything from the SPI bus. The SPI Read is used to read the data from the SPI bus into the microcontroller. The data present in the SPI bus will be stored in the SSPBUF, we have to wait till the complete data is stored in the Buffer and then we can read it into a variable. We check the BF bit of SSPSTAT register before reading the buffer to make sure the data reception is complete. The functions explained in the above section will be in the header file and they can be called into the main c file. So let’s write a small program to check if the SPI communication is working. We will just write few data into the SPI bus and use the proteus simulation to check if the same data is being received in the SPI debugger. Inside the main file we have to initialize the PIC as Master for SPI communication and then inside an infinite while loop we will write random three hex values into the SPI bus to check if we receive the same during simulation. Notice that the random values used in the program are 0A, 0F and 15 and they are hex values so we should see the same during simulation. That is it the code is all done, this is just a sample but we can use the same methodology to communicate with other MCU or with other sensors module operating on SPI protocol. Now that our program is ready we can compile it and then proceed with simulation. Proteus has a nice handy feature called SPI debugger, which can be used to monitor the data over an SPI bus. So we use the same and build a circuit like shown below. Let’s take a closer look at the data coming in and check if it is the same as the one that we wrote in our program. The data is received in the same order that we wrote in our program and the same is highlighted for you. You can also try simulating a program to communicate with two PIC microcontrollers using SPI protocol. You have to program one PIC as the master and the other as the slave. All the required header files for this purpose are given in the header file already. This is just a glimpse of what SPI can do, it can also read and write data to multiple devices. We will cover more about SPI in our upcoming tutorials by interfacing various modules that work with SPI protocol. Hope you understood the project and learnt something useful from it. If you have any doubts post them in the comment section below or use the forums for technical help. Can you make tutorials about heart rate sensor and/or accelerometer for PIC? Of course, if enough people want the same. I studying Biomedical engineering and we can use that informations for various interesting projects.